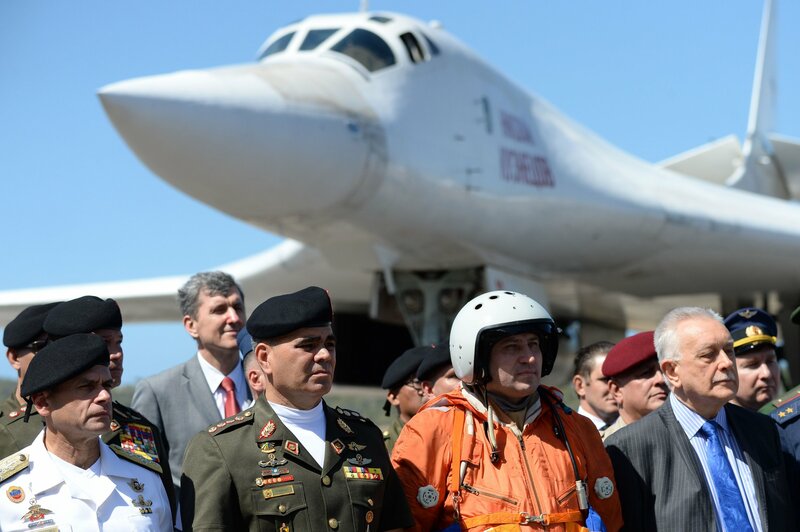 President Donald Trump has warned that Russia must withdraw a recent military delegation sent to Venezuela, suggesting he would be prepared to force it out. The White House cut ties with Venezuelan President Nicolás Maduro in January, instead sponsoring opposition-controlled National Assembly head Juan Guaidó, who declared himself acting head of state. The move came amid mounting U.S. sanctions that have damaged a Venezuelan economy already beset by internal mismanagement, and about a month after Russia sent troops and aircraft to conduct bilateral exercises in the Caribbean. White House national security adviser John Bolton—a longtime Washington hardliner who has advocated for military action against U.S. foes such as Iran, North Korea and Venezuela—warned Monday that the Trump administration “will not tolerate hostile foreign military powers meddling” within the Western Hemisphere. Secretary of State Mike Pompeo warned Russian Foreign Minister Sergey Lavrov that Washington “will not stand idly by as Russia exacerbates tensions in Venezuela,” according to the State Department. Geng said that China vowed to continue working to assist the Venezuelan government amid the ongoing crisis, which “can only be resolved by the Venezuelan people.” He then noted that “Latin American affairs are not a certain country’s exclusive business, nor is Latin America a certain country’s backyard” in a thinly-veiled reference to the U.S.
Washington has a decades-long history of battling leftist currents across Latin America and nearly came to nuclear blows with the Soviet Union over Moscow’s placement of medium-range missiles in communist-led Cuba in 1962. The tense standoff was eventually resolved when the Soviet Union agreed to remove the missiles in exchange for the withdrawal of U.S. missile positions in Turkey. Such land-based weapons ranging from 310 to 3,420 miles were later banned by the Intermediate-range Nuclear Forces (INF) treaty signed toward the end of the Cold War in 1987, but were set to make a comeback as the U.S. announced its suspension of the treaty last month, with Russia following days later. Washington has accused Moscow of violating the agreement through the development of the Novator 9M729 missile, while Russian officials accused their U.S. counterparts of breaking the deal’s terms by deploying missile defense systems allegedly capable of being used offensive in Eastern Europe.